Over the past few years the government has become increasingly concerned about the growth of extremism and wants to address this in schools through a clear definition and working towards what it regards as fundamental British values. It wishes to ensure that all students not only know and understand these values but live by them on a daily basis. The government defined British values in the ‘Prevent Strategy’ (2011), a strategy designed to prevent extremism and the radicalisation of young people in general. These values are listed as democracy, rule of law, individual liberty, mutual respect and tolerance of those of different faiths and beliefs. 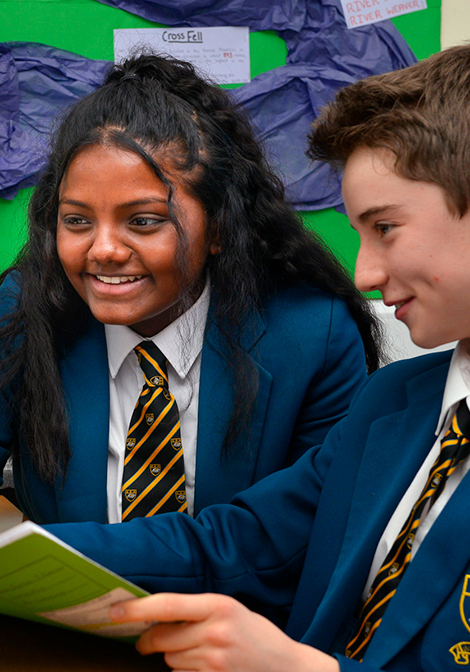 The school promotes British values through having a School Council and Year Councils, Sixth Formers serving as mentors to younger students, Literacy Leaders and Sports Leaders, providing for students taking part in debating competitions, developing the understanding of democracy through lessons such as Citizenship and History, allowing students to vote for Head Girl and Head Boy. A Citizenship Day was dedicated to democracy during this academic year and was supported by a visit from the local MP. In the past, students have visited the Houses of Parliament and some have been involved in the local Youth Parliament. Through Citizenship in the curriculum, students are also encouraged to participate in discussion to develop both listening and speaking skills as well as the ability both to defend an argument and to accept a wide variety of opinions. Team work and collaboration is encouraged and students work together on activities such as the stalls for Mini-Market, a key part of school charity work. Extra-curricular activities such as the Bar and Magistrates Mock Trial competitions also develop students’ understanding of their role in the community. The school aims to create a community that reflects the teachings of Christ based on the principles of love, caring, tolerance and respect for others along with a full understanding of the 10 Commandments and the Beatitudes and how both relate to modern life. A fundamental feature of the community is its members’ sense of responsibility to God, to each other, to oneself and to the wider community. To achieve this goal, the school fosters an awareness of the Catholic Faith within the school community so that members may participate fully and naturally in the life of the Church. The school insists on the highest standards in all matters including appearance, conduct, and behaviour. Students comply with the rules and regulations of the school which in itself reflects a strong adherence to the Rule of Law. Students are closely involved in drawing up policies such as those pertaining to behaviour and anti-bullying. They also play a full part in the recruitment of staff and their views are carefully considered. The school community benefits from good links with Community Police Officers and Transport Police Officers and are often invited into school to work with students in a proactive and preventative manner. As a Catholic school, who our students become is as important to us as what they become. Gospel values permeate all the work undertaken in the school and students are encouraged to recognise the importance of education in their own fulfilment as valued individuals for the betterment of society. This encourages each of them to take on the responsibility for their own learning and underpins the enormous success that the school enjoys. Thus, throughout the curriculum students are encouraged to think independently but in ways that reflect the values of the school and do not lose sight of distinctions between good and evil, right and wrong. This equally applies to the wide range of extra-curricular activities to which students have access. These provide additional opportunities for the pursuit of individual interests and we believe that the provision of these activities outside the classroom greatly enhance the school experience and the development of “the whole person” and encourage the pursuit of personal excellence along with commitment to team work where appropriate. The school’s Mission Statement has at its heart the declaration that ‘Everyone matters’ and this is at the core of all we do. The school has an excellent and deserved reputation and provides for its students an environment that challenges them to make the most of their God-given talents while at the same time helping them to develop as young people. Students are expected to work hard and demonstrate the highest standards of behaviour, courtesy and dress at all times. Language should never be foul, racist, sexist or homophobic; no student should accept or tolerate such language. Dress neatly, wear the correct school uniform and take pride in your appearance. Develop a responsible approach to class work and homework. This is supported by a rigorous Anti-Bullying Policy which has at its core three fundamental aims; firstly, to ensure that throughout the whole school community (including students and all school staff) there is created an ethos which ensures that bullying is seen as unacceptable. Secondly, we will provide students with skills and attitudes which help them recognise bullying in themselves and others and thus help prevent it. Finally, we will also make certain that procedures are in place for all those involved in the school community when instances of bullying arise. The Religious Education Department lies at the heart of the school’s foundation for the purpose of the spiritual and moral education of our young people. Though based on the Catholic tradition, like the school it is welcoming and sensitive to students who might not be from a Catholic background; the courses inform faith but do not require it. Indeed, part of our mutual respect is to incorporate the study of other faiths. In this way, the department not only strives for academic excellence but also provides many other aspects of spiritual and moral development. For example, students in Year 7 will study both Hinduism as a world religion and a unit on ‘I Am God’s Work of Art’ (Psalm 139) reflecting on God as the Potter and Jesus’ acceptance of us as individuals. Students at St Nicholas Catholic High School are involved in several charitable projects which run across the year and involve events such as the annual Mini-Market, which takes place each October, and CAFOD Week which takes place during Lent. Charity events are organised by the Faith in Action team comprised of volunteer teachers who meet regularly to ensure the school’s charity events run smoothly. In the 2013-14 academic year the school raised close to £7500 which was donated a very wide range of charities. Throughout their time in the school, students are encouraged to develop their sense of value of other people and their respect for moral and legal obligations underpinned by a sense of fairness, justice and mercy. The study of other world religions in RE – Hinduism in Year 7, Judaism in Year 8 and Islam in Year 9 – deepen this understanding through a whole world focus. In turn this offers the opportunity both to celebrate and respect the similarities and differences between these religions and our own. Furthermore, throughout the curriculum we celebrate different cultures, diversity and community cohesion in many different ways.